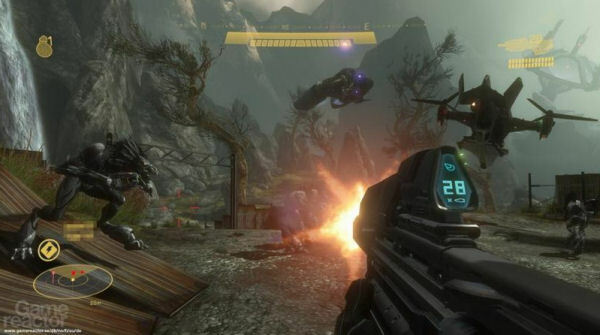 It seems like every other week now we get another leak from Bungie's Halo Reach. Whether it's a suspicious video, screens, or really really blurry screens - plenty of goodies from the game have hit the internet. Now it seems Game Reactor accidently posted some exclusive screens and artwork from the game, before yanking them down. Of course, being the internet, someone managed to snag them and post them on another site. They aren't the best quality shots, and they really don't show off much except for one locale, but it does show a noticable improvement in the Halo 3 engine in terms of lighting. The above screen does look to show off one of the new Jackal like characters as well as give you a good idea of what the HUD looks like like. Stay tuned, I'm sure there will be another video leak shortly with even more blurry info for us to drool over. For now you can view the screens and artwork right here. Page created in 0.2285 seconds.